In order to keep your Sherman Oaks home looking ready for its close-up, you’ll definitely want to keep up with your garage door repair Sherman Oaks CA. If your garage door springs are getting old, you will definitely want to invest in garage door spring repair Sherman Oaks CA. We often recommend replacing the springs before they actually break, just to be on the safe side. 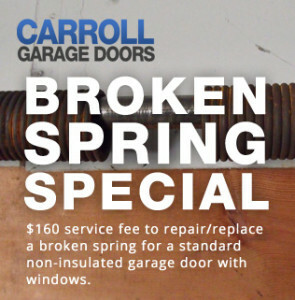 Ask us about our current spring replacement specials. After nearly 20 years in the garage door service industry, we at Carroll Garage Doors have a complete understanding of how all types of garage doors Sherman Oaks CA work. We can handle major and minor repairs on custom made doors as well as on all models from top brands like Amarr, Unique, Wayne Dalton, Genie, and Liftmaster.